Norwich City striker Lewis Grabban is grateful he is getting more opportunities under new boss Alex Neil. The 27-year-old scored his first goal since December in Tuesday's 3-2 win over Charlton in the Championship. "I think the new manager has given me a chance," he told BBC Radio Norfolk. "That was a bit lacking in the last regime and I found opportunities hard to come by. But this guy has come in and given me three starts and hopefully I can repay him." Grabban was signed from Bournemouth last summer by former boss Neil Adams and scored six goals in his first nine games for the Canaries. But he did not start any of Adams' last seven games in charge, before he stepped down as City boss at the start of January. 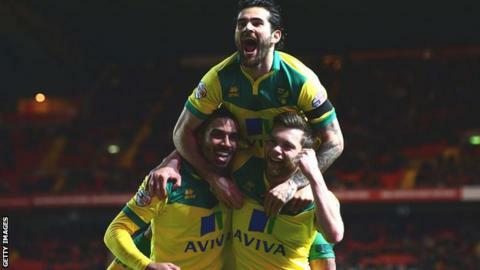 After three consecutive starts for Neil, he was able to contribute a goal to Norwich's dramatic win at the Valley. After taking a 2-0 lead, the Addicks pulled back to 2-2, before Cameron Jerome's late winner. Neil, who has won four of his six games in charge, was seen to have stern words with his players after the final whistle. "We've had two clean sheets in the last two games and I'm not pleased we didn't have another one," he said. "We need to make sure we cut those errors out. The players are disappointed themselves and it's something we want to improve on."